The Travelodge I-95, Savannah South, is easily accessible off I-95 at Exit 87. 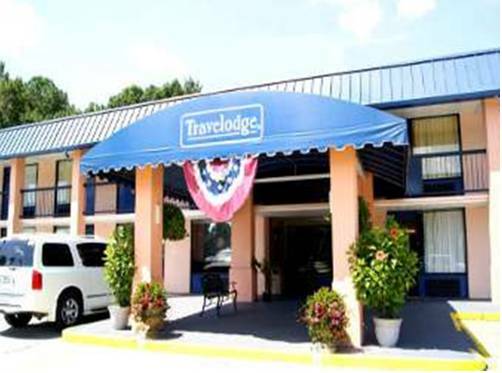 The Travelodge I-95, Savannah South is only 20 minutes from historic downtown Savannah. The hotel offers easy access to Fort Stewart, Hunter Air Force Bases, historic McAllister State Park, and River Street in Savannah. The Travelodge I-95 Savannah South is the perfect rest stop for travelers driving between Florida and northern/midwestern states. Hotel guests will appreciate a host of nearby dining options. The comfortable Travelodge I-95 Savannah South offers a free 15 item hot breakfast buffet, including, make your own Belgian waffles! Free wireless internet access in all rooms and public areas Outdoor pool, open all year 24 hour fresh fruit citrus refreshment center and free Starbucks coffee bar in lobby Pickup/dropoff point for Old Town Trolley, trolley tours of historic Savannah. Charge applies. Each spacious double or King guest room is equipped with convenient amenities such as premium in-room coffee, high speed internet access, mini refrigerator, microwave and expanded cable TV with HBO. DVD players are available. Bedside candy will be waiting for you! Come and relax with us during your stay in the Savannah area! We welcome pets 10.00 day, per pet. Book today and save! ~38 miles from Richmond Hill.